A cute, pixelated dinosaur of your very own! Ok, here’s the scoop. 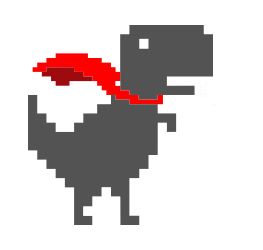 You can also get shirts, hoodies, stickers, laptop cases, throw pillows and MORE, each emblazoned with your favorite cute, pixelated dinosaur! (Cape included.) It’s all available now in the Official RefactorsaurusRex Merch Store. Now shh! Don’t tell anyone!